We're heading back to Bell Farms Supermarket for this Revisit. It's owned by Kevin Kim and managed by his daughter, Stephanie Kim. While it's a far better-run store than Kim's other (now-closed) stores in Edison and Garwood, it's still not as professional as it could be. Before we take a look at these pictures taken on 12/10/17, you can refresh your memory of the store from the original tour back in June, taken when the store was first opened. The "Bell Farms Now Open" banner has been replaced by a permanent sign on Main St., but the storefront looks substantially the same. Not a bad looking store. Except for the off-centered floodlights, which bother me. Stepping inside, we find that there is actually now decor on the walls! The store's produce selection is great, but some of the products could have been much fresher than they were. Hmm, nothing in this case is really produce. The bakery, immediately next to the entrance, is looking great. ...neither of which are operational anymore. Hot food, deli, and floral are still running. The new signage, which consists of 3-D lettering on top of a printed photo, livens up the store. I'm still not sure about the color of the walls, though. Yup, no more sushi. Just cupcakes, but that's close enough, right? One of the things I bought on 12/10 was a bag of bean sprouts that expired on 12/12 (they all did). Bell Farms put a new price tag on it with an expiration date of 12/21. Now, I have no problem with changing the date on anything -- everyone does it. But what really bothered me about this particular example was that the 12/21 tag was put next to the 12/12 printed date. Come on, at least do a good job of changing the date and put the new sticker on top of the old date! Hey, at least they spelled "inconvenience" right. And at first glance, this seems surprisingly responsible of Bell Farms -- to not sell product that could have been defrosted for a long time. I would expect them to just turn on the freezer cases again and continue business as usual. 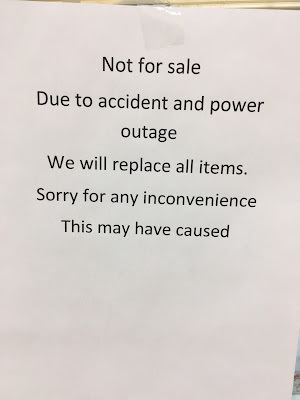 But is it a coincidence that Superfresh in Edison (also, of course, a Kim store) had a power outage that caused the frozen products to all be removed and restocked as well? Somehow that smells a little fishy to me, and it's not left over seafood in this case. Maybe it's a way to get insurance to pay for products that aren't selling? Or it could be just a real power outage; I was here the day after the first snow of the season. You never know in these old buildings. UPDATE: Yes, it is a coincidence. There was a power outage in this area due to the snow. Over to meat to see some newly-installed signage. I would have kept a few sale posters on this blank wall. The black tape on the aisle markers is peeling, revealing the Food Emporium logo on several of the aisle markers, and the fact that aisles 1 and 2 used to be aisles 16 and 12. And the "Candys"/"Potatoes Chips" sign that made it intact from Garwood to Belleville is still there...plus don't forget about the "Tomatoes Juices" sign. Really no changes in grocery. Still a pretty good selection with everything you'd need except HABA. 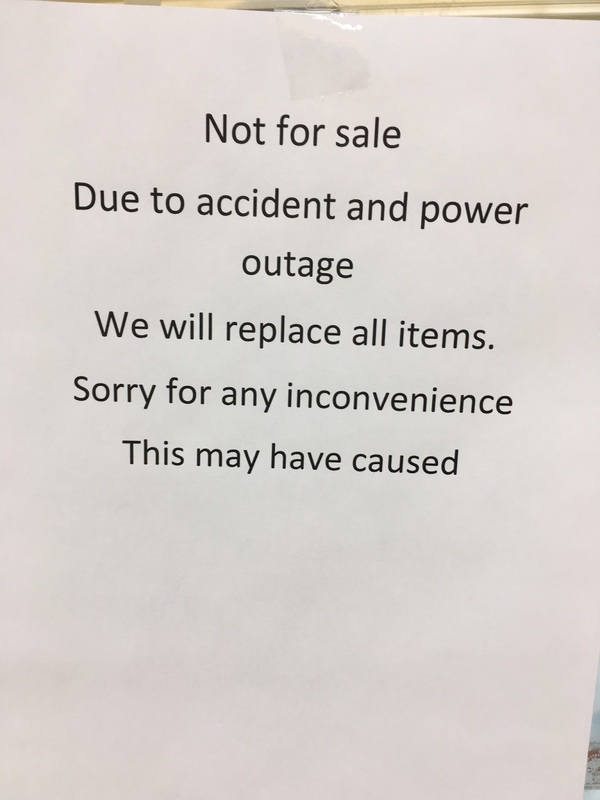 It appears that only frozen foods suffered from this power outage. The dairy, meat, deli, and produce cases were fully stocked. UPDATE: Actually, produce suffered too. As I mentioned...some of the products were not as fresh as they should have been, due to the refrigeration being out. Large spaces with absolutely nothing. It's a weird feeling, when the rest of the store is fully stocked. The freezer alcove in the front was all almost empty, and what was still in stock wasn't being sold. Lucky I didn't need any frozen foods. The front-end is not changed much either, just a new "Thank You for Shopping With Us" sign. The ridiculous security system (more like boring TV show) is in place along the front windows above the HABA section. No one ever looks at it. But the Christmas tree is a nice touch. And the registers are complete with Superfresh bags (of course, because it's a Superfresh, couldn't you tell?). They use the Superfresh card, but a Bell Farms circular. Hard to tell whether Bell Farms has gotten better since opening. The new decor is definitely nice, but the fresh products were a little on the old side. Obviously, though, I did not see the store at full capacity, so it's not fair to judge them too much.